This is where were remember that Dean has the emotional development of a 10 year old – but, actually, considering his childhood, upbringing and entire adult life of constantly being on the road, forming few to no long lasting attachments of any meaning and his closest confidants being people whose trust, loyalty and connection was forged in blood and war – it’s kind of understandable that he would. But there’s a woman in an Eye patch running around killing angels – including Castiel’s good friend Benjamin (the Black woman lasted all of 5 minutes, Supernatural be very typical). Castiel rushes to see what’s happening with Dean and Sam in attendance (all grudgy and silent treatment from Dean) and finds that the angel is definitely dead, by angel blade. Castiel turns to his old Flight members – Ishim and Mirabell, to try and get an update. They learn there’s actually been a few angels from their flight killed recently. They wonder about that – but by wonder what we really mean us that Ishim snarks about not being Castiel’s biggest fan (because, well, everything since season 6 really. 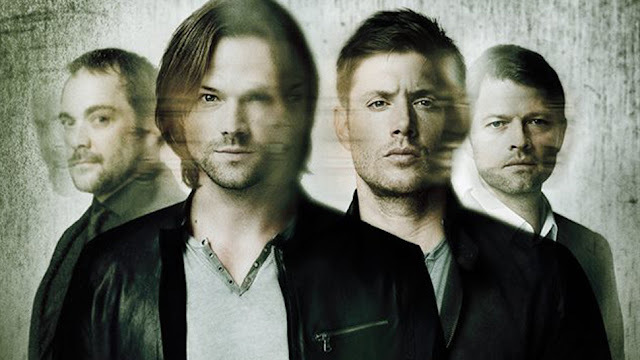 Castiel’s relationship with the rest of the angels is… complicated). Oh and Ishim totally hates humans. And she’s wandering around in the modern day now, seeking revenge. She’s looking good for a century and change. Since Ishim is injured, Castiel stays with him while Ishim lectures Castiel on why he should avoid humans because they make him all weak. In a way he’s sort of right – association with humans blurs all that angelic certainty. We’ve seen this a lot with Castiel himself –look back at the Castiel of season 4, harsher, more certain, completely unforgiving and intolerant of questions. Sam and Dean want to speak to Lily – Castiel is hostile to the idea, not ready to believe anything other than Lily being possessed and evil (that rigid angelic thinking still coming up now and then), Sam and Dean think there’s a more nuanced way to look at what she’s been through. And totally not saying the angels were in the wrong – but the angels were in the wrong basically. Ishim, for all his talk about being contemptuous of humans, fell in love with her. Or, rather, became utterly obsessed with her. She was duly freaked out by this and ran away – joined by and protected by Akobel. While Sam stays with her, Dean returns to Castiel (weak from healing Ishim) and Ishim briefly tries to defend himself by basically saying “I am angel and humans are dirty nasty horrible people” and is very unconvincing. He doesn’t try hard – after all, Castiel is ill from healing . He decides to “help” by removing the source of Castiel’s weakness – Dean. Dean has an angel banishing symbol all ready… but Castiel is weak and it could hurt him. Dean doesn’t use it. Which is when Lily and Sam arrive, thankfully ignoring Dean’s orders to stay. Between them and Lily’s angelic magic they manage to pin Ishim until Castiel delivers the killing blow. Is it over? Lily’s still not happy – Dean and Sam are ready to kill her to protect Castiel but he intervenes. He gives her an epic apology, and he does not excuse himself with his ignorance and the lies if Ishim. He invites her to leave, safely, and if she can’t forgive him she understands if he decides to return. Which is a pretty much excellent acceptance of his guilt, his responsibility and not trying to avoid it or deny her pain. She leaves, possibly to return – or to deal with her half-soulless-ness. While we’re doing the mature thing we also talk about Castiel’s “weakness” – because he has changed a lot since he was introduced, but that is not weakness. Especially given the courage and loyalty Castiel has shown. In another season he can have a deeply unhealthy co-dependent relationship just like Sam and Dean! They also confront the biggy about finding Kelly and her super-duper uber powerful Nephilim baby she has. Because they’ve just confronted the horror of killing a child who is a suspected Nephilim – are they actually willing to kill this child Really? Question – god and Amarra are back in heaven, angels can return to heaven again… so is there a reason why god hasn’t called them all back home and back to doing whatever it was angels did? Is it because the archangels are all dead? Can god not work without the chain of command? No archangels, no Metatron… the angels have no command structure. For that matter – on “cosmic consequences”, do Sam and Dean get to call in a solid from god since he kids of owes them one?